The People's Front of Judea in collaboration with the Melbourne Anarchist Club presents MARX-ISM 2014. Everyone should go to Marx-ism 2014. 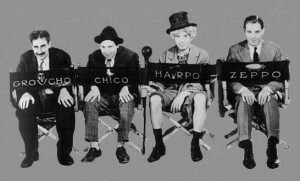 This is Australia's premier Marx Brothers extravaganza, with an explosive program of film screenings and other events! Brilliant satirical comedy that sets the benchmark for anti-authoritarian humor. Please note that this event has nothing to do with Richard Marx the popular singer, Karl Marx the composer, or Karl Marx the social theorist. Perhaps you were thinking of Marxism 2014? Entry is $3 unwaged & $5 waged. There will be free popcorn and duck soup, and other food & drinks available at nominal MAC prices. Lol. I wanna be in Melbs to hangout with you folk and watch Marx movies. Though I’d be tempted by the other mob, just to have a different sort of laugh.